If you’ve been confusing the grooming section with the outdoor grilling aisle lately, we can see why. Browse the men’s personal care offerings and you’ll likely observe a multitude of products containing a surprising ingredient: charcoal. To the uninitiated, it might come off as a marketing gimmick (dudes love to grill, right?) but it turns out the natural fuel source has some surprising implications to your skincare routine. Before you start rubbing Match Light briquettes on your face, know that not all charcoal is created equal. When it comes to health and skincare, we mostly talk about activated charcoal. This form of charcoal is heated and processed to increase its absorption ability. This unique capability to cleanse is exactly why it shows up in so many products formulated for men: because men really, really need it. “I think [charcoal] is so great for men because men in general tend to be oilier,” says Keaney. “We have more hair, obviously, and our skin is thicker, but we also produce more sweat and oil. Most of the oil on our bodies is produced on our face. It makes sense for the uniqueness of men’s skin.” The fact that charcoal is usually black (a very masculine color) only helps drive the point home. Unlike many ingredients in your skincare regimen, high concentrations of charcoal in a product doesn’t equal higher efficacy. Dr. Keaney urges you to look for products with moisturizing ingredients as well. “[Charcoal] is part of the symphony of the product, and it’s not the only ingredient that you need,” he explains. “You can clean the skin so you can remove the excess oil, but you can have to make sure the skin is hydrated.” A body wash like Dove Men+Care Charcoal + Clay Body Wash ($6), a favorite of Dr. Keaney’s, or a bar soap like Rudy’s Detoxifying Body Bar ($8) use the cleansing power of charcoal but won’t leave skin feeling tight and overly-clean. Charcoal’s cleansing properties can be especially effective as a deep-cleaning treatment (not just in a face or body wash!) and has benefits similar to that of a clay mask. “Patients have responded well to both charcoal- and clay-based products,” says Dr. Adam Geyer, NYC-based dermatologist and Skin Laundry’s Global Medical Director. 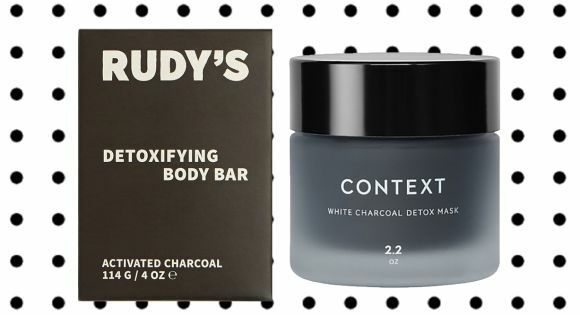 “Both have the ability to give a deep cleanse and can be very effective for oily or acne-prone skin.” Traditional masks like Context White Charcoal Detox Mask ($45), spot-treatment stick masks like Yes to Tomatoes Detoxifying Charcoal Mask Stick ($13), peel-off masks like Boscia® Luminizing Black Charcoal Mask ($34), and even sheet masks like Dr Jart+ Pore Minimalist Black Charcoal Sheet Mask ($35) are all perfect examples of the variety of ways you can use charcoal for your regular deep clean. Charcoal products can even be paired with other treatments like lasers. At Skin Laundry, Dr. Geyer helped develop a treatment called the Carbon Peel, for which a charcoal mask is applied to the face before the brand’s typical laser facial. “The charcoal binds to the stratum corneum (the outer layer of skin) and [when you] apply energy and heat, it effectively vaporizes the charcoal and pulls away that dead layer of skin,” he explains. While we could all use a thorough, pore-clarifying cleanse every now and then, it’s important to consider the rest of your skincare routine before incorporating charcoal. “If [you] are using charcoal in combination with exfoliants, in combination with leave-on glycolics or retinoids, you can strip the skin too much,” says Dr. Geyer, who notes that a balanced regimen is essential. “If [you are] very sensitive, some of these ingredients can be a little bit more challenging,” he adds. Dr. Keaney agrees, recommending that hypersensitive patients, like those who might have eczema, “just stick to the sensitive lines” when it comes to skincare. But for most men, whose main concerns are oil control and deep cleansing, you’d be hard pressed to find a more effective ingredient than activated charcoal. It’s not just marketing mumbo jumbo and focus group-inspired packaging after all — just please promise you’ll leave the briquettes to the backyard and use a face wash instead. Dr. Terrence Keaney is an Allergan paid consultant.